Flitches and Slabs — Artisan Lumber Inc. Nothing replaces the look and feel of a solid slab of wood; likewise there is no substitute for the level of continuity that can be achieved by the use of a single log in a sizable application: a kitchen with sequentially ordered sawn veneer panels and drawer faces, solid wood styles and rails as well as accompanying trim, and a number of additional details – all from one log. One log means a continuity in grain pattern and color that cannot be beat. It means the wood responds consistently to any number of finishing techniques applied. A black walnut library can be a beautiful thing; an entire library built from a single log can be spectacular. Annual growth rings appear perpendicular to the face resulting in straight grain lines and revealing any ray fleck in the wood. Sequential order means book-matching possibilities. A heavy cathedral grain pattern is exposed with this cutting method. On flat-sawn wood annual growth rings run parallel to the face resulting in a cathedral like grain pattern in the center; on rift-sawn the growth rings are at a 45 degree angle to the face resulting in straight grain. This is rift-sawn material and is idea for style and rail material as well as for table legs and aprons. 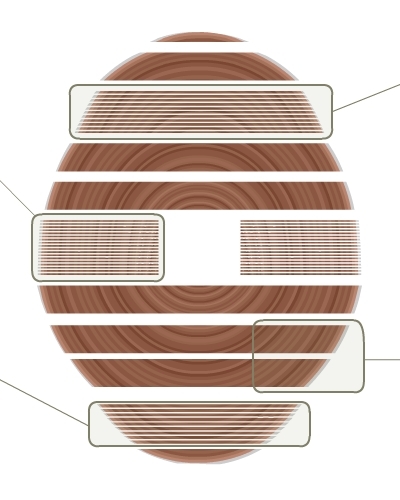 Growth rings are at a 45 degree angle to the face resulting in straight grain lines on all four sides.